The third official "By SBIers For SBIers" conference, this one was at the Crown Plaza Hotel in beautiful San Diego, California. The excitement began with a welcome reception on Thursday evening, June 4th at the hotel. Friday the 5th, Saturday the 6th, and Sunday the 7th were intense, value-packed days with a great line-up of expert speakers. All presenters were SBIers themselves who wanted to pay it forward to fellow SBIers by sharing their expertise to the max. The presenters were also attendees looking for new tips and techniques to move their online businesses forward. 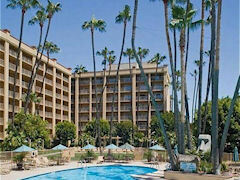 The venue for the San Diego event was the Crowne Plaza Hotel located in the heart of Mission Valley. Just minutes from the San Diego International Airport (SAN), it's also near many of Southern California's most popular attractions, including downtown San Diego, the beaches and shopping. Download a printable list of places to visit (PDF 36 KB) along with transportation information. All rooms have a coffee maker, hair dryer, ironing board and iron and in-room safe. Smoking and non-smoking rooms are available. High-speed Internet access is normally $9.95 per day, but we were able to have those fees waived for us. It has a 24-hour business center with fax, copier, e-mail and Internet services. The meeting room had free Internet service, just for us. The hotel also has an outdoor pool with whirlpool, a fitness center and sauna, a barber shop and a gift shop. They also have an on-site restaurant for breakfast, lunch or dinner. There's a sushi bar too. The room rate was $170.00 per night, whether for single or double occupancy. So for two people, that meant $85.00 per person. People wanting to share a room with another person were invited to contact us for help finding a roommate. For those NOT staying in the hotel, the cost of the conference only was $45.00 per day per person. This included: the room, the rental of the conference room and the rental for the equipment (LCD projector and screen ), and it included all applicable taxes. This was all based on a minimum of 50 people attending. Meals were not included. So everyone was free to try out some of the restaurants in the hotel itself or in the area. Download a printable list of restaurants (PDF 44 KB) easily accessed from the hotel. A deposit of $100 was required upon reservation. The show started in earnest Friday morning with this opening video by Peter Skuse of www.webvideofordummies.com. 70 Watched Us Reveal The Magic Formula! To Really Mobilize Their Monetizing Mojos! SBIers experienced three incredible days of learning, growing, and moving forward to succeed in the world of online business. Presentations covered a wide range of "pushing the Action Guide" topics. SBIers believe in the simple and real concept of building a successful business. They came to San Diego to help and be helped and keep on taking those steady positive steps forward, which you know will result in your online business being even more successful. Following is the agenda used for the San Diego Conference. 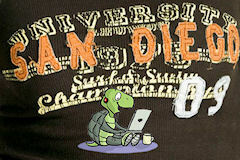 Thu, June 4 04:00-08:00 pm Welcome Reception -- This is how YOUR San Diego experience begins! Feel the electricity charging up the room as dozens of SBIers meet one another and those tortoise shells connect. Having a real online business powered by SBI! is the prime requirement to be a presenter at an SBI! conference. Look at this line-up of speakers to just imagine what you can learn and apply to YOUR business! In addition to having 15 years of Enterprise IT experience, Onuora Amobi is a successful web entrepreneur who has built several profitable web businesses both on and off SiteSell. He started using SiteSell in 2003, was a Certified SiteSell webmaster and is a SiteSell Instructor. Based on the success of some of his web ventures, in 2008 he was able to quit his six figure day job and start a profitable online marketing and web strategy firm. Onuora Amobi is now the CEO of Nnigma, Inc., a leader in full life cycle, Business to Web transformation services. Nnigma enables customers to increase internet sales, improve brand perception and deliver online business value. Carla's SBI! experience includes owning several SBI! Web sites, her latest efforts being www.best-friends-forever.com and www.themedicinehut.com. She is also an active moderator in the SiteSell forums. She holds a B.S. in Business from Southern Illinois University and has authored several books. She has an Elementary Education teaching certification from Texas A&M University-Commerce and is mid-way through her Master's Degree in Education. Currently, Carla works for SiteSell Inc. overseeing the Quality Assurance program and the SBI! Web Site Reputation Builder program. She has also worked as a coach in the SBI! Coaching program. May Cropley trained in ministry and counseling and worked for many years as student counselor in her church, where her husband was the pastor. For 10 years, she also managed a large homeless project run by a Christian charity. Her successful "Life and Social Skills Programme" developed for the charity's clients was eventually adopted by all the other homeless projects in Fife. With this, and the "Staff Development Programme" she initiated, the charity won the prestigious Fife Business Award, and the Investors in People Award. In 2006, May left the charity to run a property investment business with her husband. Then in April 2007, May started her website, scotlands-enchanting-kingdom.com using SBI!. After a solid start, May is now taking her online business to the next level. Her passion for her niche is matched by her desire to encourage others to reach their full potential. Kim Carroll built two SBI! websites in a little over two years. Before that, she owned and operated her own landscape and design business called, "Inside Out." Bad knees forced her to quit her offline business. It turned out that SBI! was a match made in heaven to continue her passion and share her knowledge. Prior to owning Inside Out, Kim worked in Interior Design, wrote a staff development program for a multi-million dollar child development center, developed a music curriculum and worked at various other jobs. In October 2008, she oversaw the SBI! 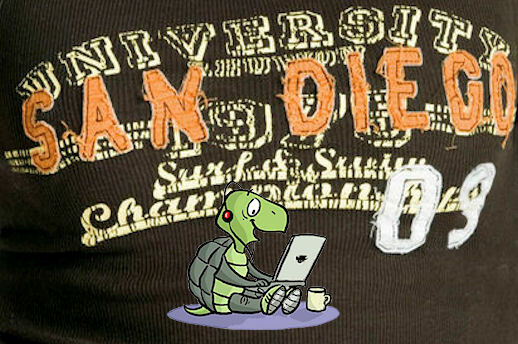 Orlando conference, and will be overseeing the event in San Diego. Kim's online business continues to grow, all a result of the SBI! tools, as well as her own desire to share ideas for inside and outside investments. It goes without saying that she loves to help other SBIers succeed in their online endeavors. Helen Chang is business editor at San Diego News Network, www.sdnn.com, an online news site. Helen is an accomplished writer and journalist, winning top awards in the 2008 contest held by the San Diego chapter of the Society of Professional Journalists. Her work has appeared in Time, BusinessWeek, San Diego Business Journal, Fodors.com and many others. She has also ghostwritten books, workbooks and e-books on topics ranging from real estate investing to personal memoirs. A graduate of University of California, Berkeley, Helen's mission is to add abundance, peace and joy in the world through stories that inform, touch and inspire. Hmm... sounds like a true SBIer, which she is. Says Don "After too many years in engineering management and sales, I left it all cold turkey in 1996 to become an Internet business consultant." Since that time, he's developed nearly 150 Web sites, mostly in English, but also in French and Spanish. Although still a registered professional engineer in Quebec and Ontario, Don no longer practices engineering, preferring instead to focus completely on building Web sites/businesses that really work. This means using the proven C-T-P-M methodology whether in the classroom for SiteSell Education or for clients of SiteSell Services. He sees this as yesteryear's work in value engineering tieing in seamlessly with SiteSell's value offerings to its customers, all made possible by a team of SBI! enthusiasts handling everything from precise and reliable market research to flawless site operation. He currently devotes 100% of his time to SiteSell Education and SiteSell Services. this SBI! Conference San Diego page.